Cook the potato in salted water and mash with a fork. Grind the ham and mince the onion then add them to the potato along with an egg and pepper. I don’t add salt because the ham is salty and the potatoes are cooked with salt, but you can add salt if you prefer. Mix the ingredients together and form into patties. Cook the patties in 2 tbs olive oil on medium-high until both sides are brown and crisp. Cook eggs in your desired fashion. I poached mine in a little olive oil. 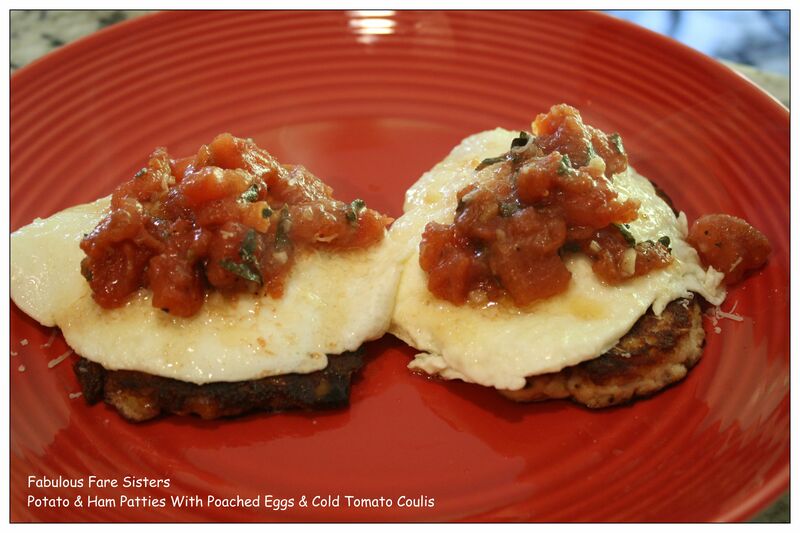 Click on the Coulis for my tomato recipe or you can buy a store bought bruschetta. Top with a little Parmesan cheese and dive in. The finish look is great! Tasted better than it looked too. Wow looks amazing! I love all of these flavors. Thanks Lynn. The ham patties were especially crispy and good.